T3.com was recently invited to go behind the scenes at Ford's Valencia plant to see how it ticks. It's the place where they manufacturer the new Mondeo as well as other vehicles including the Galaxy and Transit Connect. The Valencia plant is one of Ford Europe's biggest properties and is a huge operation – the plant will deliver around 400,000 vehicles this year. Around 100 vehicles come off the line every hour (that's one every 40 seconds) - here you can see them undergoing final checks before they roll out of the shop floor. Touring around the plant in our steel-toecapped boots, it quickly became obvious just how slick everything was. Each model is produced on a single production line, meaning that each vehicle goes through pretty much the same process, whether it's a workhorse van or a Vignale-finished Mondeo. Vignale is Ford's Mondeo badge at the premium end of the price list - each car undergoes 100 hand checks on the fit and finish. The plant has produced more than 11 million vehicles and over 15million engines since it first opened in 1976. Almost all the production is exported, including to the US. Ford is part way through a €2.3 billion investment into expanding the facilities at the plant including new paint shops and engine manufacturing facilities. Huge trolleys of body parts are everywhere - 2,000 ton presses stamp each panel before the core body is then welded together (above). Nobody lifts anything – it's all done by robots that can lift up to a ton and the whole initial stage is automated, with parts arriving to the line as they're needed.The factory uses over 18,000 different components, while there are thousands of different variants of vehicle. These complete body shells are waiting for transfer to the paint shop (again, this is all done automatically). Ford was keen to show us several key innvovations at the plant. The pre-paint prep process uses Ostrich plumes to brush the car before painting (as you can see below, it looks a bit like a car wash). The idea is that static is removed, so the car has a better finish as a result thanks to the lack of dust adhesion. Dust is then extracted via a industrial vacuum. According to Ford, each female ostrich feather is up to 76 centimetres in length, weighs less than 3g, and can last as long as five years. The vehicle is then painted. The 3-Wet paint process adds corrosion protection, followed by a waterproof sealant and then an exterior coat (primer, base and clear coats). Ford estimates CO2 emissions are reduced by up to 25 per cent because of this process. Why? Because the process is 'wet' - it doesn't require any drying to take place between coats. The drying only happens at the end of the process in 180 degree centigrade ovens (this bit of the plant was quite warm). This bit of the process is referred to as the marriage – it's when the body shell is brought together with the engine and transmission before other components are added such as the windows, seats and dashboard. 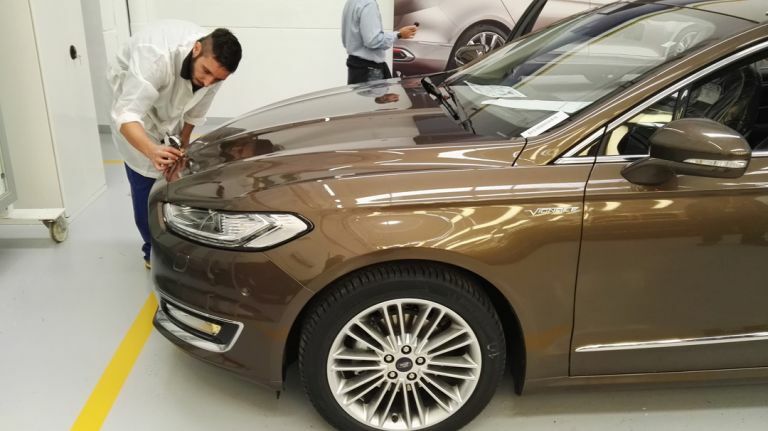 Ford also has an innovative way for finding defects in the paintwork - called the Dirt in Paint Vision System, it was developed in collaboration with the Polytechnic University of Valencia. The system works by taking photographs of the vehicle (some 3,150 each time) under super-bright strip lights and analysing them against a pre-defined vehicle pattern. The plant also has a dedicated Wi-Fi network for the installation of software to power Ford's in-car connected system, Sync 2 – vehicle-specific language packs are downloaded meaning that the right version of the software gets to the right car. Here you can see the system has identifed a slight defect on the rear door of this Ford Kuga. Error correction and eradication was big part of what we were shown at the plant - quality matters in all manufacturing of course, but the majority of what we were shown involved various ways in which build quality can be enhanced. Here an engineer is testing a sample panel for any errors to make sure everything is within the allowed tolerances. Every vehicle is driven on what Ford calls its “Rattle and Squeak” circuit where everything is tested for interior noise and panel fit. We can confirm that it was pretty bumpy! A small percentage of vehicles are also given the test you can see below, where the car's interior sound is tested. The system can even detect when a foreign object is placed in the car, like a coin, and we saw this in action. Normally, it's used for making sure the car has no internal rattles.